Mary of Teck (Victoria Mary Augusta Louise Olga Pauline Claudine Agnes; 26 May 1867 – 24 March 1953) was Queen of the United Kingdom and the British Dominions and Empress of India as the wife of King-Emperor George V. Although technically a princess of Teck, in the Kingdom of Württemberg, she was born and raised in England. Her parents were Francis, Duke of Teck, who was of German extraction, and Princess Mary Adelaide of Cambridge, a granddaughter of King George III. She was informally known as "May", after her birth month. At the age of 24 she was betrothed to Prince Albert Victor, Duke of Clarence and Avondale, the eldest son of the Prince of Wales, but six weeks after the announcement of the engagement he died unexpectedly of pneumonia. The following year she became engaged to Albert Victor's next surviving brother, George, who subsequently became King. Before her husband's accession she was successively Duchess of York, Duchess of Cornwall, and Princess of Wales. As queen consort from 1910, she supported her husband through the First World War, his ill health and major political changes arising from the aftermath of the war, and the rise of socialism and nationalism. After George's death in 1936, she became queen mother when her eldest son, Edward, ascended the throne, but to her dismay he abdicated later the same year in order to marry twice-divorced American socialite Wallis Simpson. She supported her second son, Albert, who succeeded to the throne as George VI, until his death in 1952. She died the following year, during the reign of her granddaughter Queen Elizabeth II, who had not yet been crowned. On this site at Craigwell-on-Sea in the Parish of Aldwick, stood Craigwell House where HM King George V and Queen Mary were in residence from 9th February to 15th May 1929 during the King's convalescence. The original house pre-dated 1806. The last owner was Sir Arthur du Cros who by 1934 had embarked upon development of its extensive grounds. The house was demolished in 1938. Traces of its foundations and of tiled storerooms exist under houses now on the site. 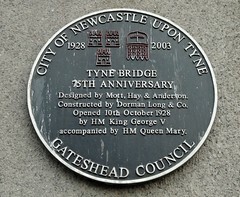 1928-2003 Tyne Bridge 75th Anniversary. Designed by Mott, Hay & Anderson. Constructed by Dorman Long & Co. Opened 10th October 1928 by HM King George V accompanied by HM Queen Mary. Their majesties King George & Queen Mary when visiting Becontree on Tuesday 12th June 1923 took tea in this cottage & planted two trees on the adjacent green. 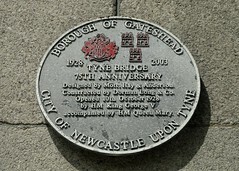 1928-2003 Tyne Bridge 75th Anniversary. Designed by Mott, Hay and Anderson. Constructed by Dorman Long & Co. Opened 10th October 1928 by HM King George V accompanied by HM Queen Mary. The Bishop's Meadow. 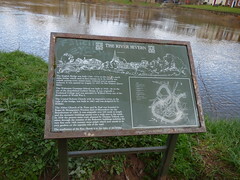 This meadow is vested in the Hereford corporation as a public open space and playing field in perpetuity through the generosity of the Right Reverend John Percival D.D., Lord Bishop of Hereford. Who gave the leasehold in 1914 and of the Right Reverend Charles Lisle Carr. D.D., Lord Bishop of Hereford. Who gave the freehold in 1937. 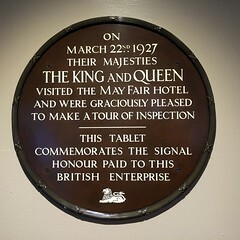 This tablet was unveiled by Her Majesty Queen Mary on the 29th July 1937. The Foley Arms Hotel. This Georgian style coaching inn was designed in 1810 by Samuel Deykes for John Downes. It opened as the Down's Hotel, but was soon renamed the Foley Arms after the lord of the manor, Edward Foley. Above the main entrance is the crest of the family of Princess Mary of Teck (later Queen Mary, royal consort of George V). The princess presented the crest after her six week stay in 1891. 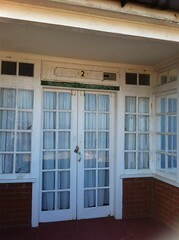 These premises were refurbished by J.D. Wetherspoon in November 2010. Railway Station. Before 1848, only aristocratic or wealthy classes could visit Harrogate, but the opening in that year of railway lines to Brunswick and Starbeck stations enabled great numbers of the general public to visit the town in search of health and leisure. Visitors had to travel to central Harrogate by horse-drawn carriage or donkey cart, but in 1862 the North Eastern Railway Company constructed a link line with a new station in the developing area of central Harrogate. Designed by company architect Thomas Prosser, who had also designed York Railway Station, the new station was the first public building in Harrogate to be built of brick. In 1896, an improvement programme provided extended platforms and a beautiful glazed entrance canopy, by which time the station boasted eight platforms. At this time, the often exclusive nature of Harrogate’s visitors entitled the Station Master the rare honour of wearing a silk top hat. In 1965 the Victorian station building was replaced by the present structure designed by Harold Taylor as part of a tower block development. 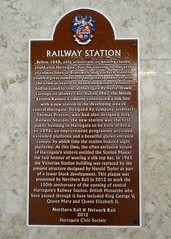 This plaque was presented by Northern Rail in 2012 to mark the 150th anniversary of the opening of central Harrogate’s Railway Station. British Monarchs who have passed through it have included King George V, Queen Mary and Queen Elizabeth II. The River Severn The English Bridge was built 1768-1774 on the site of a much older bridge which used to have houses on it. In 1925 it was rebuilt reusing every sound stone, widened and its gradient reduced. It was opened on August 13 1927 by Her Majesty Queen Mary. The Wakeman Grammar School was built in 1936-38 on the site of the demolished Carlines House. It was originally a Technical College and was attended by Wiflred Owen one of the finest poets of World War I. The United Reform Church with its impressive tower, to the right of the bridge, was built in 1863 and was designed by G. Bidlake. The Abbey Church of St. Peter and St. Paul was founded by Roger de Montgomery Norman Earl of Shrewsbury for the Benedictines in 1083. It was originally over 100 yards in length and the monastic buildings spread over a wide area to the south. In 1836 the present main road, planned by Thomas Telford, was taken through the remains of the Refectory buildings isolating the very fine early 14th century stone pulpit which now stands in its own gardens on the opposite side of the road. The confluence of the Rea-Brook is to the right of the bridge.